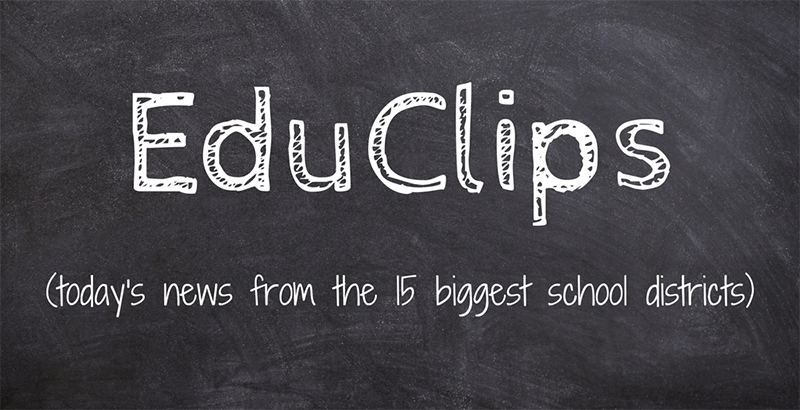 EduClips is a roundup of the day’s top education headlines from America’s largest school districts, where more than 4 million students across eight states attend class every day. Read previous EduClips installments here. Get the day’s top school and policy news delivered straight to your inbox by signing up for the TopSheet Education Newsletter. ESSA BLOCK GRANTS — Many districts are about to get a big boost in funding for the most flexible piece of the Every Student Succeeds Act: the Student Support and Academic Enrichment Grants, better known as Title IV of the law. The program just got a big, $700 million boost from fiscal 2017 to fiscal 2018, bringing its total funding to $1.1 billion. And it could get even more money next year, because the House appropriations subcommittee in control of federal education spending is seeking $1.2 billion for the program in new legislation. Districts can use Title IV funding for a wide range of activities that help students become safer and healthier, more well-rounded, or make better use of technology. And districts have a lot of leeway to customize Title IV to their needs. However, districts that get $30,000 or more must do a needs assessment and spend at least 20 percent on an activity that makes students safer and 20 percent on something that makes kids more well-rounded. Want the day’s top school and policy news delivered straight to your inbox — for free? Sign up for the TopSheet Daybreak Education Newsletter.